I saw a cool new TV commercial tonight in which Charlotte, specifically its Uptown buildings, is the star. Verizon has rolled out a national campaign to promote how its "network of technology, people, and ideas" is benefiting businesses and communities. In the commercial featuring Charlotte, it highlights how the city is using "Verizon technology to inspire businesses to conserve energy and monitor costs, making communities greener." 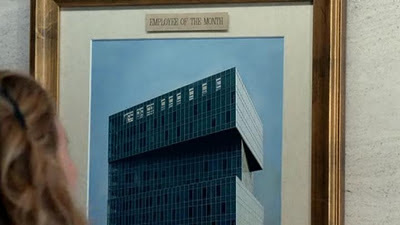 The creative premise of the commercial shows a series of Uptown buildings being honored as employee of the month inside their respective offices. Those include the new UNC Charlotte Center City Building and NASCAR Hall of Fame, among others. Watch the video below. If you visit the Verizon website dedicated to this campaign, verizon.com/plus, and click on the "Energy" tab, it takes you to several resources, including white papers and case studies on smart grid and cloud technology. There's also a link to Envision Charlotte, an initiative led by Duke Energy's Smart Energy Now program that uses digital grid technologies to display real-time energy data throughout Uptown, to create awareness and encourage behavioral change. The goal of this initiative is to cut energy use in Uptown by up to 20 percent by 2016. Several major corporations and organizations have partnered with Duke Energy on this, including Bank of America, Wells Fargo, Cisco, Verizon, Mecklenburg County, the City of Charlotte, and others. Plans for Envision Charlotte have been in the works for the past year, and the campaign officially kicked off last Friday (click here to read The Charlotte Observer article). Below is a video from last year, in which former President Bill Clinton announces Envision Charlotte at the 2010 Clinton Global Initiative Annual Meeting. He's joined on stage by Duke Energy CEO Jim Rogers, Cisco CEO John Chambers, Mayor Anthony Foxx, and Charlotte Center City Partners President Michael Smith. All of this strengthens the momentum Charlotte has been building over the last few years to grow its energy sector. Several local leaders want the city to be known as an energy hub as much as it is known for banking, and the motivation behind energy is propelled by the possibility of job creation, in addition to environmental sustainability.